The first time I truly heard Walt Whitman was when Garrison Keillor read selections from "Song of Myself," accompanied by Leo Kottke on guitar. I was driving North on highway 280 south of San Francisco, on the spine of The Peninsula. The setting sun made silhouettes of the mountains to the West, and brightened the fog in the long valleys below. Beneath the fog lay the Crystal Springs and San Andreas reservoirs, the latter of which gives its name to the world's most famous fault. The setting was perfect. So was the reading. 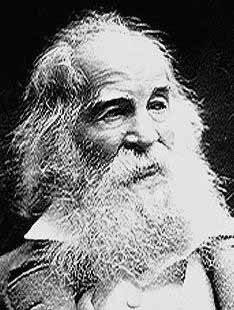 This man, "Walt Whitman, American," wrote with the same force and arrogance as Beethoven. But while Beethoven was "a titan, wrestling with the gods" (as Wagner put it), Whitman was an ordinary man with a calm awareness of the holy power in us all. "I know I am solid and sound," he said. "To me the converging objects of the universe perpetually flow. All are written to me, and I must get what the writing means." Thank God he didn't keep what he got from the rest of us. To a born apologizer like me, these words spoke like a burning bush. They pushed aside the overpaid guardian at the gates of my soul, walked into my sanctum and told me who I was. Later I bought a copy of Leaves of Grass, and abridged it to a size I could carry in my pocket. It isn't the only scripture that guides my life. But it's about the most reliable. "If you want me again look for me under your boot soles," Whitman said. Or in your pocket. Or in your browser. Scholars may fault what I've done to Whitman's book-long Song. I won't apologize. If a few footprints of his stanzas do for you what they do for me, the effort is more than worthwhile for both of us. Finally, I offer this piece with grace and love to Peter Searls, my firstborn son. More than anybody I know, Pete is the "bold swimmer" Whitman wills us all to become. and become undisguised and naked. and of hay in the barn. words loosed to the eddies of the wind. a reaching around of arms. or along the fields and hillsides. The song of me rising from bed and meeting the sun. I have heard what the talkers were talking. and go and bathe and admire myself. and of any man hearty and clean. and none shall be less familiar than the rest. And watching and wondering at it. I have no mockings or arguments. I witness and wait. I believe in you my soul. The other I am must not abase itself to you. Loafe with me on the grass. Loose the stop from your throat. Not words, not music or rhyme I want. Not custom or lecture, not even the best. Only the lull I like. The hum of your valved voice. such a transparent summer morning. and reached till you held my feet. And brown ants in little wells beneath them. Fetching it to me with full hands, a child said, What is the grass? How can I answer? I do not know what it is any more than he. that we may see and remark and say Whose? about the dead young men and women. and the offspring soon out of their laps. What do you think has become of them? All goes outward, and nothing collapses. ... and am not contained between my hat and boots. and all their adjuncts good. But I am not an earth nor and adjunct of an earth. all just as immortal and fathomless as myself. These are the thoughts of all men in all ages and lands. They are not original with me. they are nothing or next to nothing. If they do not enclose everything they are next to nothing. wherever the land is and the water is. This is the breath of laws and songs and behavior. This is the tasteless water of souls. This is the true sustenance. It is for the illiterate. It is for the judges of the supreme court. It is for the federal capitol and state capitols. This is the trill of a thousand clear cornets and cream of the octave flute and strike of triangles. I play not a march for victors only. I play great marches for conquered and slain persons. Have your heard it was good to gain the day? I also say it is good to fall. I sound triumphal drums for the dead. and selves sank in the sea. and all who overcome heroes. how it stings to be slighted. For me the children and the begetters of children. you are not guilty to me, nor stale nor discarded. I can never be shaken away. this is the murmur of yearning. and the mica on the side of a rock has. This hour I tell things in confidence. And I am a poet of the soul. I am the poet of the woman the same as the man. I chant a new chant of dilation and pride. We have had ducking and deprecating about enough. I am he that walks with the tender and growing night. Earth of the departed sunset! Earth of the mountains misty topt! Smile, for you lover comes! Prodigal! you have given me love! Therefor I give you love! Thurster holding me tight that I hold tight! I guess what you mean. I behold from the beach your crooked inviting fingers. We must have a turn together. I undress. Hurry me out of sight of the land. Cushion me soft. Rock me in billowy drowse. Dash me with amorous wet. I can repay you! Howler and scooper of storms! I am integral with you. I too am of one phase and all phases. and of the demonstrable and of immortality. And am not the poet of goodness only. Evil propels me, and reform of evil propels me. My gait is no faultfinder's or rejecter's gait. to be worked over and rectified? and some is only the ore of right. Soft doctrine a steady help as stable doctrine. our rouse and early start. This minute that comes to me over the past decillions. Through me the afflatus surging and surging. Through me current and index. Of the fog in the air and beetles rolling balls of dung. and I remove the veil. Voices indecent are by me clarified and transfigured. I do not press my finger across my mouth. as around the head and heart. I believe in the flesh and the appetites. of the spread of my body. Breast that presses against other breasts, it shall be you. Vapors lighting and shading my face it shall be you. rub against me it shall be you. mortal I have ever touched, it shall be you. nor whence the cause of my faintest wish. satisfies me more than the metaphysics of books. The little light fades the immense and diaphanous shadows. Something I cannot see puts upward libidinous prongs. with the daily close of their junction. If I could not now and always send sunrise out of my self. We also ascend dazzling and tremendous as the sun. the calm and cool of the daybreak. My voice goes after what my eyes cannot reach. it is unequal to measure itself. why don't you let it out then? Come now, I will not be tantalized. You make too much of articulation. Writing and talk do not prove me. They neither hasten their own delivery nor resist it. Logic and sermons never convince. I think I could turn and live awhile with the animals. Not one kneels to another nor to his kind that lived thousands of years ago. Not one is respectable or industrious over all the earth. I am a free companion. I bivouac by invading watchfires. They fetch my man's body up dripping and drowned. I understand the large hearts of heroes. The courage of present and all times. I am the man. I suffered. I was there. I am the hounded slave. I wince at the bite of the dogs. I do not ask the wounded person how he feels. I myself am the wounded person. and I am the clock myself. The friendly and flowing savage: who is he? Behavior lawless as snowflakes. Words simple as grass. Uncombed head and laughter and naivete. They descend in new forms from the tips of his fingers. They are wafted with the odor of his body and breath. They fly out of the glance of his eyes. open your scarfed chops till I blow grit within you. Spread your palms and lift the flaps of your pockets. I am not to be denied. I compel. I have stores plenty and to spare. I do not ask who you are. That is not important to me. but what I will infold you. I seize the descending ;man. I raise him with resistless will. O despairer, here is my neck. By God, you shall not go down. Hang your whole weight upon me. I dilate you with tremendous breath. I buoy you up. Every room of your youse do I fill with an armed force. The weakest and shallowest is deathless with me. What I do and say the same waits for them. the same flounders in them. I know perfectly well my own egotism. and cannot say any less. But I know it is sure and alive and sufficient.